It features a clean and slick design along with virtually endless styling combinations possibile via the Styling Module that comes with the template. It is very well documented and is a breeze to set up and customize. It ships with PSD files containing all design elements found in the template, as well as a built in powerful tool for customization of your theme’s colors, fonts, backgrounds, elements, texts etc. AquaCart utilizes Camera slider, Nivo Slider, jQuery Library, CloudZoom, jQuery Carousel, Google Web fonts and more to contribute to an enjoyable, intuitive and functionally exhaustive user experience. Among other features AquaCart is SEO friendly and is Cross Browser compatible. 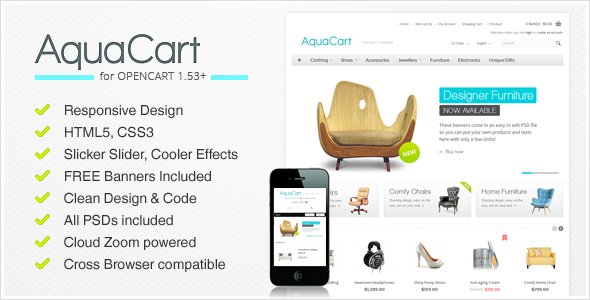 AquaCart is based on OpenCart 1.5.3.1 and is now 1.5.6 fully compatible. AquaCart now supports the latest OpenCart 1.5.6!